Amazon Price: $16.09 $14.95 (as of March 1, 2019 10:47 am – Details). Product prices and availability are accurate as of the date/time indicated and are subject to change. Any price and availability information displayed on the Amazon site at the time of purchase will apply to the purchase of this product. A popular DJ at the hottest station in Nashville, Charley Layton is doing what she's always wanted to do: living in the heart of country music. 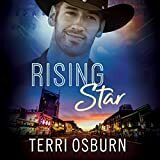 Charley puts her career first and relationships second, but when a charismatic stranger in a black cowboy hat invites her back to his place, she decides to give herself one night of no-strings fun. But Dylan Monroe isn't a no-strings kind of guy. Charley is beautiful, brainy, and brassy as hell – the kind of girl he's always wanted. When his record label books him an interview on Charley's show, he's determined to find out why he woke up alone, and when he can see her again. With Dylan now the most eligible bachelor in country music, Charley doubts their fling stands a chance, but she's willing to try. Dylan dreams of fame, but he also craves a life offstage with Charley. Can he convince her that both of their dreams are worth chasing, and that love is still possible, even in the spotlight?